The Cattier Organic Softening Body Lotion moisturises, softens and smoothes the epidermis. Its delicious formula enriched with aloe vera and coconut butter, with moisturising, nourishing and protective properties, leaves the skin soft and supple. With Cattier Softener Milk for Body, its exotic perfume of vanilla and coconut wraps the skin in a delicate satin caress. 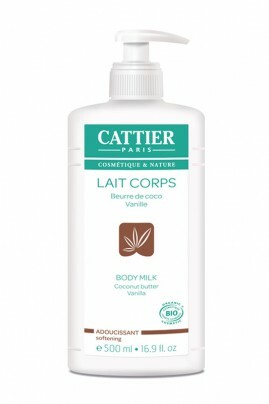 For a pure cocoon feeling with CATTIER Organic Moisturizing Milk ! Apply generously the Cattier Softening Body Milk all over body concentrating on drier areas. Massage until complete penetration. Only healthy & organic ingredients with Cattier Softening Body Milk !